Prior to my mom’s fall, she had already shown mobility issues- she was very unsteady when she walked. She could not walk without the aid of a walking stick. There are some items that I had bought and changes that I have implemented. Prevention is always better than cure because a fall could cause a bone to fracture or break thus destroying the quality of life of both the person and the caregiver. No doubt, there is no guarantee that a fall would not happen, but we do the best we can. When my mom first needed additional support for walking, she had been very unwilling to use any walking aid. They tend to be like this because it is also hard to accept the fact that they could not walk unaided ….and need to be gently persuaded. Actually I would recommend to use at least the quad walking stick and not just a cane with one leg. However if you are dealing with a very stubborn old lady, you need to approach with tact. A cane is better than not using any walking aid at all. She refused to have a walking stick so I got her an umbrella walking cane from the market for about RM14 (about USD3). I started bringing along the umbrella cane when going out with her for marketing, citing that I bring it along as I am afraid it is going to rain. Note: I noticed the cane umbrella is priced much more expensive in the US. Then when carrying bags of heavy items, I asked her to help me take the cane as both my hands were carrying things. She took and then I asked her why not use it for walking. And she found the umbrella cane gave her good support especially when she needed to take a step up or down the pavement or walk along uneven surfaces. With each time, the objections got lesser and lesser. Not long, the umbrella cane became an indispensable must-have that she will take along when going out. An umbrella walking cane is not the same as a normal umbrella that has sharp end that is slippery. The handle of the umbrella resembles a cane and the edge has a rounder non slip rubber. 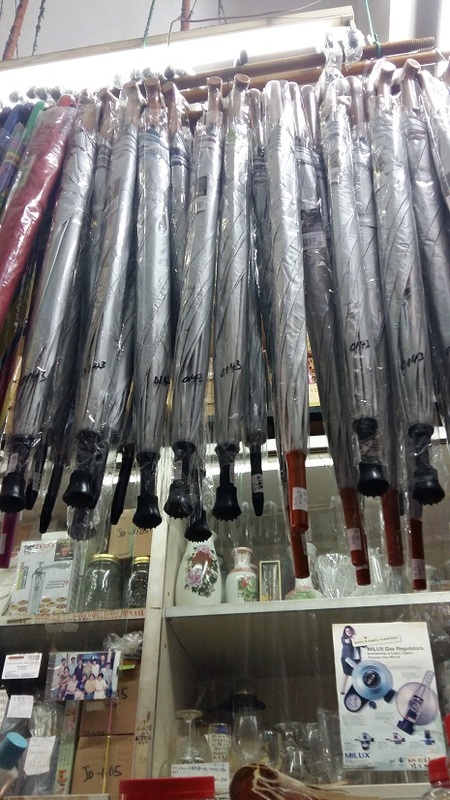 I have bought her at least 4 of such umbrella canes (and another as a gift to an elderly neighbor) over the span of few years as being the inexpensive items they are, there is no such thing as a spare part for the rubber. She could accept it better because in her mind, she thinks that people think she is using an umbrella and not a walking stick. She said so to me herself. But you and I know better  …..people are not so easily deceived. Once, she placed the umbrella cane in her trolley and went to look for some items. When she came back to the trolley, her umbrella cane was stolen. But I wasn’t because I people don’t go round stealing just an umbrella. And umbrella canes are notoriously hard to find. I figured the person must have need it or have a family member who needs it. I am happy to let the person have it. I always have spares at home and to keep in our cars just in case. With time, my mom’s legs gone weaker, I bought the quad walking cane. My friends and her friends started warning me that the umbrella walking stick just would not do. She literally raised her voice at me when I suggested to get her one. Not to be deterred, I snuck out and bought, then hid quad cane in the car boot and took out and hide somewhere when she was not watching. The quad walking stick and subsequent items I have bought from Lifeline Innovators (http://lifeline.com.my) as they sell items in good quality, hence I will use their photos from their site as those were the exact items I bought anyway. By then, she is already reliant on using a walking aid. However, there are places where an umbrella is not allowed such as in a library. She wanted to visit the library so I took along the quad walking stick (because I know the guard would not allow her to take the umbrella in). I got her to use the quad walking stick. Gradually, she finds better stability with the quad walking stick as with the umbrella. And she started using the quad walking stick both when going out and eventually even in the house. Then this year, she started to become weaker and weaker. At the persistence of my mom’s friends who were very concerned, they suggested she used a walking frame. A friend of my mom who had undergo knee operation used a walking frame instead of a quad walking cane as her orthopedic surgeon suggested a walker is better. I snuck out to Lifeline to buy a foldable walker, portable wheelchair and a commode. Cost me a few thousand ringgit (fortunately I was still working then). Her friends and concerned neighbors came for a visit and they all lectured her to use a walker. They even show her how to use it. But my mom also have a bit of what seems to be Alzheimer symptoms. She has difficulty learning and remembering the steps on how to use the walker. Also, the walker made her walking very slow. Till today, the walker stays in my living room as a decoration piece (just kidding). I actually positioned the walker strategically as a hand support (she has one hand on the quad stick and another holding the walker as she comes out of her room). If the elderly person is forgetful, don’t get the walking frame with wheels because he/she may forget to lock the wheels when they intend to be stationary and start leaning heavily on the walker for support. Also sometimes the walker can still move even though locked for example at a slope. When I had to admit my mom to hospital, she was struggling so much that we got a wheelchair from the hospital to push her around from the examination room, then to the Xray/ultrasound, then back to see the doctor. When she got discharged from the hospital, she was too weak to walk to the parking ….I bought the wheelchair from home to wheel her from the ward to the car park. As she got on the wheelchair, she knew she need to use it as she was too weak to walk. The hospital then arranged a number of appointments to monitor her situation (as her hepatitis is quite acute and her liver in quite a bad shape). Usually you can leave your driving license at the security counter and they would loan you a wheelchair. But there was a day where no wheelchair was available- we had to wait for someone to surrender back a borrowed wheelchair. So it cleared the mystery which I initially had on why I see so many people bring along their own portable wheelchair when the hospital has wheelchair service. After that, when I take her to hospital, I bring her wheelchair along. Reason I bought it instead of the normal bigger wheel ones is because the wheelchair above is light and easier for me to carry. I often bring her alone and had to carry other items (like her medical files, water, jacket and shawl as it can get cold, newspaper, some food in case she gets hungry and my purse). But one consideration you need to make….the small wheels make breaking less effective- even if you put the brakes on, the chair would still move downhill on a slope. This is a little regret I had as both the portable bigger wheel and the one I bought cost almost the same. When going up on travelators (the type found in hypermarkets where trolleys are used a lot), the first time I literally broke in cold sweat because I had to use literally my entire strength to prevent her from sliding downwards. That is why, you may want to consider the bigger back wheels but still light enough that you can manage to carry. And if the user knows how to wheel himself or herself, then you need to get with the bigger wheels. In the case of my mom, she does not seems to remember these steps (even though she was a former nurse who had ironically served at orthopedic ward before). And remember, you yourself need to wear a pair of shoes with grip lines…not the type that makes it slippery even for you to walk. Coz when you have to hold on the person, the moving wheelchair with your dear life and all your strength, you do not want to slip or move downwards. A wheelchair is useful for the elderly who is too weak to walk because by using a wheelchair, he/she would be able to follow the family when going out. Going out, being part of the family’s activities makes them happy. Happiness helps them manage pain and illness better. It would reduce the number of dejected looking old folks whom I often see sitting in a bench all by themselves while the rest of the family disappears to goodness know where just because they could not walk and catch up with the others.. Ensure you go to a good shop where the sales officer is knowledgeable enough to advise you on the best options instead of just trying to push sales. All these items are not cheap and you do not want to find yourself making bad buying decisions. I have been to Lifeline few times and each time their sales officers are knowledgeable and do not practice hard selling. I tell them my situation and they recommend what they think is useful ,The quality of the items is also good and the items are solid and not flimsy. When the elderly person either is not able to walk quickly or urine incontinence or both, it is time to get a commode. It is basically a chair with a toilet seat. That was also what I bought and hid in the store room (to be used if the time ever come). She was angry when she saw it and also start lashing on how I am being so wasteful buying such things she does not need. They sometimes say nasty things …..don’t take it personally because they are also afraid when they find themselves getting into this situation. After a few times of wetting her pants due to not getting to the bathroom on time, she was willing to use try the commode after some gently persuasion and encouragement. She does not want to use diapers, which I agree because once a person start on diapers, it would cause diaper rash and if not cleaned properly can led to infection. If the situation does not make it totally necessary, it is better not to be reliant on diapers or pads long term. Now, she prefers to use the commode but would still walk to the bathroom to pass motion. The commode I bought from Lifeline is quite solid and not flimsy so she could hold on for support before sitting. I would take and flush down the plastic container then give it a few rinses before putting it back. Similarly with the walker, I don’t advise to get those with wheels because even though you lock the wheels, it is not 100% stationary as anything with wheels are. Note: However when she had a fall, there were a few weeks she could not use the commode because she could not get up without sharp pain. I would write about what I did in future articles. Hopefully this articles helps you with your elderly loved ones who are getting more and more unsteady on the knees and is too weak to walk long distance.